The Chakras are major energy centres of the body and a deeper energy system that often hold deeply held, historic patterns. 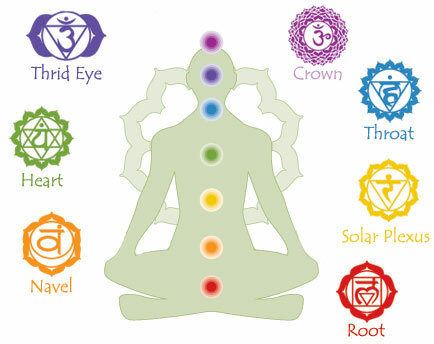 The major Chakras are seven energy centres which align with the spine. The word Chakra means vortex, disc or wheel and they are vortices or pools of energy that spin clockwise and counter clockwise, at multiple levels and form a junction between the physiological and consciousness. This energy projects out from both the front and the back of the body. They are thought to mediate the flow of Qi (life force energy) from the universal field into us. Chakras are both individual in nature and interactive with each other and are often referred to as centres of consciousness. Each Chakra differs in vibrational frequency in relation to the parts of the body they align with eg. liver, gall bladder, kidneys heart. These vibrations are thought to differ from those of human consciousness. Within our energy system we can think of the chakras as major cities, the meridian acupoints as towns and villages and the meridians themselves as the pathways that connect them all. Chakras bear the core emotional and physical functions our being. We carry our history, our family legacies and rooted habits and patterns here, along with our emotional, mental, physical and cognitive habits. They also service the organs, ligaments and other body parts that sit within their field, supporting and governing the endocrine system and physical body. When chakras are congested our vital life force is unable to circulate resulting in a lack of mind body integrity. Working with the Chakras can help remove blockages and stagnant energies and bring fresh energy into our system, regulating body chemistry to enable body system balance. This can improve mental acuity and produce profound and permanent shifts in well being. Balancing the chakras brings more coherence in our whole being and provides with an opportunity to be stronger and more flexible and buoyant. Balanced chakras helps us instil a ‘pause button‘ for the triggers of life and enable us to become more resilient. What is often remarkable, is that Chakra energy is very responsive and surprising easy to work with using on intention, breath, movement, or pendulum. When we work with the Chakras we aim for balance so that they are able to spin in whatever direction it needs easily and fruitfully.